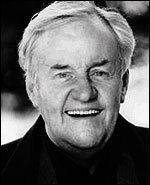 Although he has confessed he began his career knowing absolutely nothing about acting, Richard Briers has developed into an immensely popular actor. In the 1960s, '70s and '80s he became the quintessential situation comedy husband with three defining roles; newlywed George Starling, the self-sufficient Tom Good and the obsessive-compulsive Martin Bryce. Encouraged by his cousin Terry-Thomas , Briers enrolled at RADA , where he graduated with a silver medal and employment at the Liverpool Playhouse . While his theatre career flourished he made his small screen debut in the television play The Murder Club (ITV, tx. 3/12/1961), followed by roles in the Jimmy Edwards comedy vehicle The Seven Faces of Jim (BBC, 1961). He had his first comic starring role in the legal comedy series Brothers in Law (BBC, 1962). Shortly afterwards, he confirmed his talent with his role as George Starling in the popular Marriage Lines (BBC, 1963-66), co-starring Prunella Scales . Briers continued to make his mark as a comic actor, teaming up with Arthur Lowe in seven Ben Travers Farces (BBC, 1970), with Michael Hordern in a series of two-handed sketches, Tall Stories (BBC, 1972) and appearing in two more sitcoms, Birds on the Wing (BBC, 1971) and Barry Took's adaptations of Stephen Potter's 'Lifemanship' manuals, One-Upmanship (BBC, 1974-78). He struck gold with John Esmonde and Bob Larbey's middle-class suburban comedy The Good Life (BBC, 1975). Briers liked the scripts but only accepted the part of Tom Good because he was short of money. This proved to be a wise decision. Quitting the rat race, the happy-go-lucky Good and his wife Barbara ( Felicity Kendal ) amused audiences with their attempt at self-sufficiency and agricultural innovation. High ratings and Royal approval followed, establishing the series as a comedy classic. This kick -started a fruitful relationship with the writers, resulting in The Other One (BBC, 1976), Ever Decreasing Circles (BBC, 1984) and Down to Earth (BBC, 1995). The second of these was particularly popular, providing Briers with a character that was the complete antithesis of Tom Good. The anally retentive pillar of the local community, Martin Bryce, struck a chord with television audiences, and is Briers' own personal favourite sitcom role. By no means 'just' a comedy actor, Briers' work has embraced Nöel Coward ( Hay Fever , BBC, 4/8/1968), Alan Ayckbourn ( The Norman Conquest Trilogy , ITV, 1977) and Shakespeare ( Twelfth Night , ITV, 1988). Briers' warm, expressive voice has become a familiar fixture of commercials and, notably, children's animation: Bob Godfrey's Roobarb (BBC, 1974-75), Noah and Nelly (BBC, 1976), two versions of Watership Down , the 1978 film (d. Martin Rosen) and the 1999 television series (ITV), and as Rat in two episodes of The Wind in the Willows (BBC, 1994-95). His early film appearances were sporadic and largely minor, but through his association with Kenneth Branagh he has expanded his cinematic career with Henry V (1989), Peter's Friends (1992), Much Ado About Nothing (1993), Mary Shelley's Frankenstein (1994), In the Bleak Midwinter (1995), Hamlet (1996) and Love's Labours Lost (2000). Other films include A Chorus of Disapproval (d. Michael Winner, 1989), Unconditional Love (US, 2001) and Smee in Peter Pan (US/UK/Australia, d. P.J. Hogan, 2003). In recent years, he has turned to one-off dramas; the BAFTA-winning Skallagrigg (BBC, 9/31994), P.G. Wodehouse's Heavy Weather (BBC, 24/12/1995), The Student Prince (BBC, 29/11/1997) and as architect Joseph Paxton in Victoria and Albert (BBC, 2001). Awarded a CBE in 2003, Briers still loves playing for laughs. He delighted audiences with his characterisation of the eccentric laird Hector Macdonald in Monarch of the Glen (BBC, 2000-).